In June 2012, Seattle reissue label Light in the Attic rereleased Dreamin' Wild, a barely heard 1979 private-press album by two brothers from rural eastern Washington, Donnie and Joe Emerson. Dreamin' Wild arrived during a banner year for the label, which a month later would release the soundtrack for the surprise hit documentary Searching for Sugar Man, about obscure Detroit singer-songwriter Rodriguez (whose music Light in the Attic had begun reissuing in 2008). The Emerson brothers were the subjects of lengthy, glowing profiles in the Guardian, the Los Angeles Times, and the New York Times. The standout track on Dreamin' Wild, a blue-eyed soul number called "Baby," appeared in the 2012 romantic comedy Celeste and Jesse Forever and the 2013 dramedy The Spectacular Now. Indie-rock misfit Ariel Pink covered "Baby" on his 2012 album Mature Themes, when he was at the peak of his fame. But the Emersons never would've had their moment if it hadn't been for a resale shop in Spokane, Washington—that's where record collector Jack Fleischer stumbled upon a sealed 1979 copy of Dreamin' Wild in 2008. Fleischer has said he found the LP in an antique store, but in a 10,000-word opus on the Emerson brothers published in 2016 by Creative Nonfiction's monthly spinoff, True Story, New York Times features reporter Steven Kurutz calls it a junk shop. In either case, Fleischer paid $5 for one of the few dozen original copies of Dreamin' Wild that had ever left the Emersons' house. 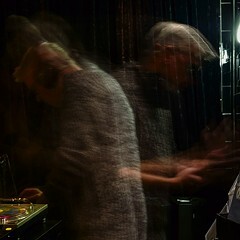 Outcomes as spectacular as his are rare, but collectors and DJs routinely seek out music at secondhand shops. In fact, one of New York City's best-loved record shops is a Brooklyn thrift store called the Thing, whose basement holds thousands of unorganized records priced at $2 apiece. I often visit vintage, thrift, and charity shops myself in search of cassettes, records, and CDs. It's usually a very different experience from shopping in conventional record stores, whose stock tends to be organized and curated, even though it changes from week to week—I know I can walk into, say, Dusty Groove and find a great, cheap used rap 12-inch in less than ten minutes. Secondhand shops, by contrast, rarely sort or catalog their collections in any way, so that it's futile to take any approach other than "see what you can see." Such stores are often the last stop records make before the landfill, and browsing their collections can feel like panning for gold in a sandbox. I don't mind spending 15 minutes at a Goodwill, though, digging through battered Herb Alpert discs and high school marching-band LPs—the longer I look, the slimmer the chance I'll find anything interesting, but even the tiniest chance is worth 15 minutes to me. Record stores can provide the same thrill of potential discovery, of course, and in case you're looking for an extra reason to visit one, the 12th annual Record Store Day is this Saturday. 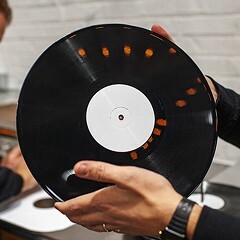 RSD's founding principle is to support local record stores, but I don't think such support should be confined to shops that stock RSD special releases. Thrift stores can be great places to buy music, even if they devote only a small fraction of their floor space to it. To prove it, I decided to hit up some local thrift stores. I couldn't visit every one, but I wanted to go to enough to answer some questions: Where do vintage, thrift, and charity shops get their music? How do they present their stock? Are shops in the big thrift chains mandated to carry all the same Barbra Streisand LPs? Not all the stores answered my questions, unfortunately—if they were part of a larger organization, the process got tangled up in red tape. I wasn't able to set up a time to talk to a representative of the Brown Elephant resale shops, and though I reached Village Discount Outlet's general manager, he didn't respond to my queries before publication. But I did leave every shop with a better understanding of its music selection—and usually a desire to return. Click here for an interactive map of participating shops and listings of their discounts, giveaways, events, in-store performances, and more. According to Medill Reports Chicago, Pilsen Vintage & Thrift is the largest secondhand store in the neighborhood, and two years ago owner Paul Guizar hired Charly Garcia, cofounder of local Latinx DJ collective and label Sonorama, to manage its music stock. "All the records you see on the first floor, we used to have it in the basement, so I had to dig up all those records," Garcia says. "I had to go downstairs with a mask." Browsing the shop's remarkable selection of vinyl, cassettes, and eight-tracks is more like shopping at a record store than at a typical thrift store. Garcia has cleaned the 12-inches and organized them by genre (funk, world, rock, soul, electronic, hip-hop); at least half the records bear not just price tags but also stickers noting their condition. 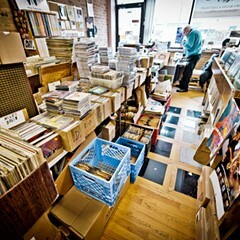 LPs make up the bulk of the collection, spread out on a few shelving units along with a healthy number of seven-inches. Garcia says most of the music stock comes from neighborhood folks, some of whom are offloading their vinyl collections because they've been pushed out of Pilsen by gentrification and don't want to move them. People can donate vinyl or try to sell it to the shop, though if they want to get paid, they have to clear a higher bar—Garcia won't buy just anything. "It's mostly people who are there to get some money, just because they don't want those collections," he says. Pilsen Vintage generally has plenty of Spanish-language discs, and on my trip I saw a handful of seven-inches from Discos Joey, a long-running norteño label based in San Antonio, Texas. Browsing the hip-hop, dance, and rock sections, I spot a late-90s 12-inch single by Cincinnati rap group Mad Dog Clique, Jon & Vangelis's 1981 LP The Friends of Mr. Cairo, and an LP released by a team of Northwestern undergraduates running a music production company and label called the Niteskool Project. Garcia says music isn't typically what draws customers to Pilsen Vintage. "We never promote the records," he says. "The Instagram mostly is clothes and fashion stuff." But once people come inside, the music gets their attention—Garcia estimates it accounts for 30 percent of the store's sales. I leave with three seven-inches (including Sue P. Fox's entry in Kill Rock Stars' 1998 mail-order singles club) and a $2 dance cassette from Istanbul for a total of $11 plus tax. The Brown Elephant resells donated items to support Howard Brown Health in its mission to provide care for the LGBTQ+ community. Of the store's three locations (Andersonville, Lakeview, and Oak Park), I went with the northernmost one. I'd been before, and remembered its music selection as respectable—much larger than at the Lake­view store. Records, cassettes, and CDs don't appear on the Brown Elephant's online list of items that it says it accepts—but they're not barred either. If you're not specifically hunting for music at the Andersonville shop, you could easily miss its designated space near the register on your way into the cavernous former ballroom that serves as the shop's main space. It holds a small shelf whose six compartments are mostly full of vinyl, with three crates of records stacked on top of it and bookshelves of DVDs on either side. I noticed some decent CDs—plus an obviously homemade CD-R copy of U2's Zooropa with "Pirated Limited Ed." handwritten on its spine—but I focused my attention on the store's hodgepodge of unorganized records, which all sell for $1. I found more delights than dreck, though some of the stock was definitely everyday thrift-store rubbish—I can't imagine who might want three records by Charlie Rich (the guy who did "Behind Closed Doors") but doesn't already have them. Bear in mind, however, that you're listening to someone who's entertained by seemingly worthless private-press LPs—at the Brown Elephant, for instance, I found Yale Sings, an old compilation of the school's vocal groups that I would've bought if the vinyl had been a little less scratched up. I considered a radio-­station copy of AC/DC's Powerage and a slightly water-­damaged edition of Funkadelic's America Eats Its Young, but I left with just a clean copy of Real Drugs, a 2014 EP by defunct local garage-rock group Party Bat. When Kokorokoko co-owner Ross Kelly decided to open a vintage store focused on the 80s and 90s, he modeled it after the Boston-based chain he'd worked at in the late 90s: Newbury Comics, which carries not just comics and graphic novels but also music, toys, and pop-culture ephemera. Kokorokoko sells mostly clothing, though music—dance, hip-hop, vintage metal—has played a major role in its identity and history. 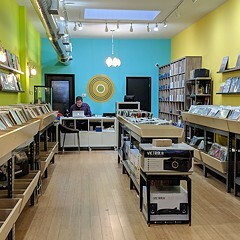 When the shop opened in 2009, it was a few blocks away at 1112 N. Ashland, and Kelly says it got lots of customers who were on trips to Dusty Groove just to the north—and about a quarter of the people who came in did so to buy dance records. "We do still carry a lot of 12-inch singles, 'cause we're DJs," Kelly says. "That's what separates us from a multipurpose record store or something like a thrift store, which is 100 percent broad spectrum—where you're like, 'Oh, there's an Andy Williams record and there's a DJ International acid-house or hip-house record in here too.' We're working the same lane in a way, but we're distilling all the Andy Williams records and Herb Alpert records out of the mix." Kokorokoko's inventory of cassettes and records reflect the shop's affection for the 90s, like the bulk of the rest of its offerings—band T-shirts, heavy-metal trading cards, buttons. 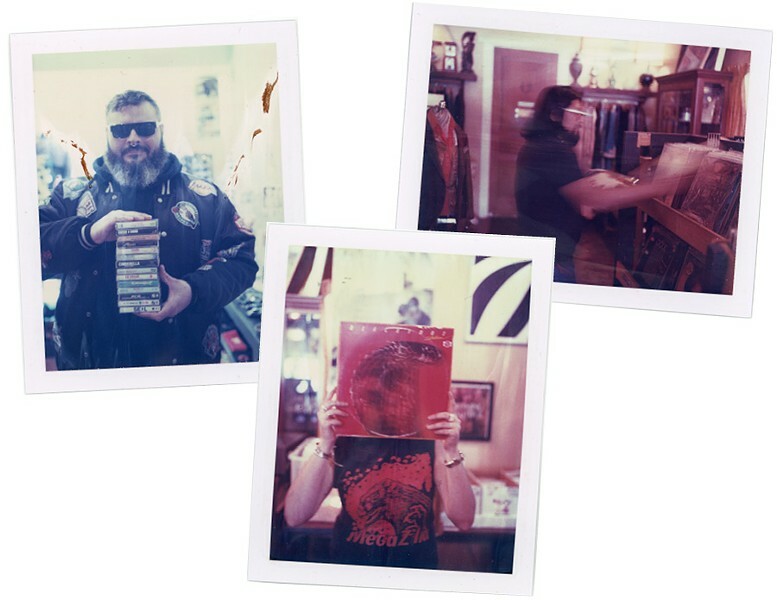 Unlike most thrift stores, Kokorokoko doesn't accept donations—Kelly and co-owner Sasha Hodges travel around the midwest buying stuff, and the size of their music collection fluctuates based on what they find. "Two, three years ago, there was a lot of people coming here just to buy cassettes—we had probably 1,000 of them out on the floor at one point," Kelly says. 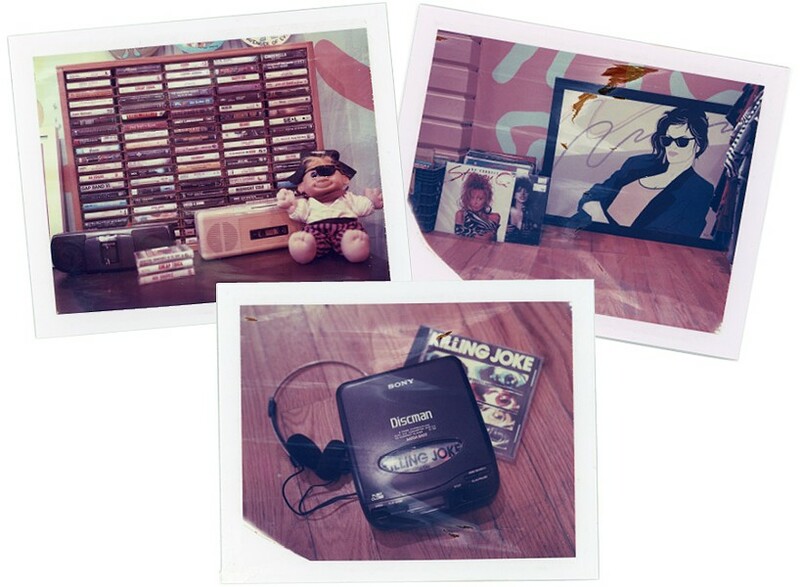 "At that point, maybe 15 percent of people coming in were just coming in for the cassettes." The cassettes are displayed in the shop's entryway, while its small selection of records shares the main space with the clothes. I spend too long staring at a sealed copy of "You've Been Messin Around," a local hip-house 12-inch that Delle Del & Jamin Jack Starling released on Basement Records in 1990—it's a decent deal at $12, but I can't pull the trigger on it. If you've spent much time thrifting in Chicagoland, you've probably gone to one of its 12 Village Discount stores. I decided to visit the southernmost location in the city—the only outlets further south than the Chicago Lawn Village Discount are in Chicago Heights and Hammond, Indiana. Clothes take up the great majority of the store, and the records occupy one corner of a room marked "miscellaneous." 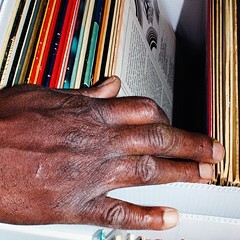 Short stacks of sleeveless seven-­inches are threaded through their center holes onto two long horizontal hooks sticking straight out from the wall, above a shelving unit full of old binders, photo albums, and two deep rows of LPs. There are few enough records that you can see everything in less than 15 minutes, though the selection is fairly run-of-the-mill. I spot some Lawrence Welk, some concerto LPs I don't remember anything else about, a bunch of John Denver, and two copies of Jud Strunk's 1973 country album, Daisy a Day. I'm not in the market for a used copy of Marvin Gaye and Kim Weston's 1964 seven-inch "What Good Am I Without You" b/w "I Want You 'Round," but it still breaks my heart to find a copy with a chunk knocked out of its edge. I end up leaving with weathered copies of the Association's Insight Out and the 1955 single "In the Year of Our Love" b/w "Hey! Ba-Ba-Re-Bop" by west-side singer Lola Dee. I also buy the empty sleeve from the split LP We're Pullin' Together by the Downtown Sound and the Music Company, released in 1986 by local indie polka label Bel-Aire (like I said, I'm a sucker for odd private-press releases). All the store's LPs and seven-inches sell for $2, but since We're Pullin' Together has no vinyl, I get a discount. Wilburn Green came to Chicago in 1979, and he says he opened Another Man's Treasure 18 years ago—by then he'd already been going to thrift stores for decades with his family. Before he entered the secondhand business himself, Green remembers, he had a cousin who'd refurbish discarded mattresses and box springs and sell them. "I knew then that the saying is true—one man's trash is another man's treasure," he says. Green's store is near the southern edge of Back of the Yards, and it originally occupied almost all of its freestanding building—he displayed loads of furniture and knickknacks throughout a storefront and a large banquet hall connected to it. But about a decade ago, Green decided to turn the hall into a functional events space—it already had a small stage, and Green owned the furniture and gear to do the rest. He dubbed the space the Ambrosia Room (currently it hosts blues sets on Thursday nights), and he stuffed all the stock for Another Man's Treasure into the storefront. "That's why I've got so much piled up," he says. Green gets a lot of stock from people in nearby neighborhoods—senior citizens trying to downsize or just people donating things they don't want. He also has a connection at a local U-Haul storage facility, and occasionally he bids on the contents of abandoned lockers sight unseen. "Winning the auction, you have to take everything that's in there," he says. "The last two times I've been over there, it's garbage—I learned earlier that if you enjoy the fragrance of a rose, you have to accept the thorns that it bears." About 20 percent of the inventory at Another Man's Treasure is music, Green estimates, though most of it is out of sight. With the exception of a small cassette selection, it's in a closet-size room behind a DJ booth in the Ambrosia Room. Inside the room, a wooden shelving unit takes up an entire wall, stretching from floor to ceiling, and holds hundreds of records—mostly 12-inches, with smaller stacks of seven-inches and 78 RPM records. A turntable tipped vertically balances precariously atop a haphazard stack of vinyl. Green says most of the people interested in buying music from him own record stores or sell music themselves, and they generally call ahead. 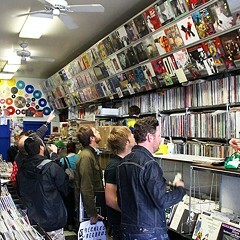 Few walk-ins want to rummage through a closet of LPs. In some ways, Dorian’s is just one more boutiquey bar and restaurant. But its record store and music bookings connect it to the neighborhood’s 1990s arts community. It’s always a good time to skip the lines and get acquainted with the great neighborhood shops that don’t partake in the annual retail circus. When record stores aren't buying used vinyl directly from the public, they might find a carload of goodies at the Chicagoland Record Collectors Show.